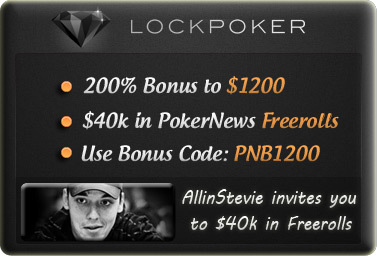 PokerNewsBoy owner and sponsored Lock Poker Pro Stevie Devlin, better known as ‘allinstevie’ at the online poker tables, is pleased to announce that he will be hosting the final PokerNews LockPRO Supremacy freeroll with a $7,500 prize-pool –not to mention the $100 bounty that will be placed on 25 select Lock Poker Pros and guests in each tournament! This gives you FOUR chances at winning a $7,500 Freeroll tournament, as well as 100 chances to collect an additional $100 by knocking out one Lock Poker’s pros –for a total of $40,000 in cash up for grabs! This promotion is only available through PokerNews.com, but thanks to PNB’s Stevie Devlin hosting the final tournament we are pleased to offer to any player signing up at Lock Poker using our Lock Poker Bonus Code PNB1200 when making your first deposit entries into ALL FOUR FREEROLL TOURNAMENTS. A $10,000 guaranteed tournament on Lock Poker (which is what each freeroll amounts to) would normally cost you a $33 entry fee PLUS REBUYS! By using Lock Poker bonus code PNB1200 when you sign-up and Stevie Devlin is basically giving you FOUR FREE buy-ins to these tournaments! This is one of the best freeroll opportunities in all of online poker. To qualify for all four of the PokerNews LockPRO Supremacy Freerolls simply sign-up at Lock Poker and make a $50 deposit using Lock Poker bonus code PNB1200. And maybe you can be the one to knock out Stevie Devlin and collect the $100 bounty he’ll have on his head. Players who have already signed up at Lock Poker using bonus code PNB1200 will also be eligible provided that they have deposited $50 or more into their Lock Poker account, as well as earning 50 Lock Points during the tournaments qualification period –50 Lock Points is equal to $5 in rake, so this shouldn’t be an issue for even a penny limit poker player. If you’ve been thinking about joining Lock Poker know is your chance to capitalize on this offer, and take your shot at winning four $10,000 guaranteed freeroll tournaments –and maybe picking up a few $100 bounties along the way! This entry was posted on Friday, December 17th, 2010 at 4:28 pm and is filed under Poker Promotions. You can follow any responses to this entry through the RSS 2.0 feed. You can leave a response, or trackback from your own site.